Prior to 1994, I drew almost exclusively with a drafting pencil and a straightedge. From then on, I've draw almost exclusively with charcoal. This change marked my interest in the practices of traditional fine art. In 1999, I began studying drawing under maestro and painter extrodinaire, Mr. Joe Biel. The images are arranged in chronological order beginning with the most recent and going back from there. Reflections on the current job market. Labyrinthine Projection portrait of my lovely wife. Diptych portrait of Air Jordan XI and its designer Tinker Hatfield. The work was installed in the Footwear Materials Library on the Nike WHQ campus by commission. Labyrinthine Projection pdrawing of Air Jordan XI sneaker executed in topographical style. Labyrinthine Projection pdrawing of Air Jordan III sneaker executed in topographical style. 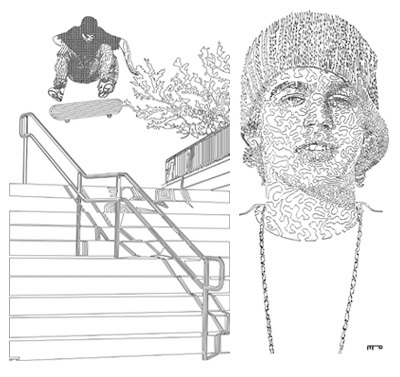 Nike SkateBoarding commissioned me to draw images of their new pro skater, Paul Rodriguez, for their 5000 square foot wall in downtown Los Angeles. Click here to see the drawings. Portrait of the lovely Miss Patricia Peterson. Impromptu figure drawing session with two Swiss girls and a Dane. A lively Swiss girl I met in Belize. Portait in colored charcoal of the emerging Shekina: goddess of the Caribbean.